He was born in Barrow, the son of Al and Maggie Hopson, the grandson of Alfred Henley Hopson, a whaler from Liverpool, England, who settled in Barrow in 1886. He was the first child to be born in Barrow's mission hospital. When he was 15 years of age, Eben wrote to the Commissioner of Indian Affairs in Washington, D.C., to complain about the school principal's use of unpaid student labor on small BIA public works projects. When the BIA forwarded the letter to the principal in Barrow, Eben was branded a troublemaker and was prevented from boarding the BIA ship to travel to boarding high school. Remaining in Barrow through his teens, Eben worked as a construction laborer until 1965. He married Rebecca Panigeo in 1942. In 1957 he became a member of the Operating Engineers. He was drafted in to the Army when Rebecca was eight months pregnant with their first child and was not to see his first son until he returned to Barrow in 1946. During the war he was employed in the lend-lease program that delivered new war planes to Soviet crews in Nome. Later, he served as a bosun's mate aboard an Army tug boat along the Aleutian Chain. In 1946, Eben began his political career as a member of the Barrow City Council. During the following two decades, he worked on the construction and maintenance of the DEW Line sites. Eben joined the Alaska National Guard in 1949 and, by 1953, had attained the rank of Captain, Command Company D, First Scout Battalion. In 1956, Eben was elected to the Alaska Territorial Legislature and, when Alaska became a state, he was elected to the first State Senate. He served in the Senate until 1965 as Chairman of the Labor and Management Committee. In 1965, Eben helped organize Alaska's first regional land claims organization which entered an aboriginal claim to all of the traditional land of the Arctic Slope Inupiat. He became the first Executive Director of the Arctic Slope Native Association (ASNA) which launched the Alaska Native Land Claims movement that year. In 1968, after serving as the first Vice-President of the Alaska Federal of Natives (AFN), Hopson moved to Anchorage to become its Executive Director. Under his direction, the AFN became a strong, well-financed federation of the native regional associations of all Alaska. During that time, he launched the Washington, D.C. native land claims lobby that secured the enactment of the Alaska Native Land Claims Settlement Act in 1971 which awarded the Alaskan regional and village corporations a cash settlement of nearly $1 billion and entitlement to roughly forty million acres. Eben left the AFN to become Special Assistant for Native Affairs to Governor William Egan in 1970. Working closely with Egan, he helped shape a new State policy toward the native land claims which enabled State financial participation in the land claims settlement enacted by Congress. From his desk in the Governor's Office, Hopson insured the State's cooperation with the Arctic Slope Native Association to organize the North Slope Borough: a plan that would provide the 4,000 residents of Alaska's eight most northerly villages with the advantages of a county-type home rule municipality, one that would encompass 88,000 square miles, reaching from the Canadian Border to Point Hope on the Chukchi Sea, and from the Arctic coast to the crest of the Brooks Range. Revenues would come from the billion-dollar tax base growing on the Prudhoe Bay oil fields. In 1972, Eben left the Governor's Office to campaign for voter approval of the organization of the North Slope Borough, and for the office of Borough Mayor, to which he was elected. Substandard housing in the Arctic had been tolerated too long, according to Hopson. Housing was the single greatest social problem on the Arctic slope in 1972, and both the Arctic Slope Regional Corporation and the North Slope Borough responded. Upon incorporation, Hopson sold $13.7 million in municipal bonds to finance the construction of public housing for low-income families. The project was plagued with setbacks which included the capsizing of supply barges on the Alaska coast, and ice conditions at Nome which prevented passage of other barges for months. Once the supplies arrived, much time was taken hiring and training the local hire personnel which Eben demanded for the housing construction. But with persistence, Hopson saw the homes built and finally won the financial participation of the U.S. Department of Housing and Urban Development (DHUD) in the NSB housing project. In 1974, Hopson declared his candidacy for the Democratic Party's gubernatorial nomination and ran against Governor Egan. He withdrew from the primary race after reaching a nine-point political agreement for rural Alaska, including the development of modern communications. Most of the points of this agreement with Governor Egan were later implemented by Governor Jay Hammond who defeated Egan in the General Election. In 1975, Hopson was re-elected Borough Mayor. That same year he was invited by Congressman John Melcher (D - Montana), Chairman of the House Interior Subcommittee on Public Lands, to send a planning team to Washington to work with the Committee staff to draft legislation that resulted in the transfer of the Naval Petroleum Reserve #4 to the control of the Department of Interior. In 1976, Hopson won his party's Congressional nomination. He used his Congressional campaign to draw national attention to the need for both a national and international Arctic policy to facilitate environmentally safe Arctic energy development. In 1976, Hopson called upon the Inuit leaders of Greenland, Canada, the U.S., and the U.S.S.R. to form an international organization, called the Inuit Circumpolar Conference (ICC), in order to pursue these goals. The first meeting of the ICC hosted by Hopson in 1977 in Barrow. 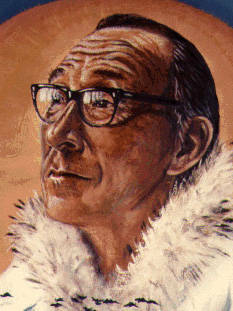 Hopson's influence on the international level was greatly enhanced when the International Whaling Commission (IWC) attempted to ban the Inupiat subsistence hunting of the bowhead whale in 1977. Eben traveled first to Tokyo and the next year to London to plead the Inupiat case that the IWC was not authorized to regulate subsistence whaling. In federal courts in Washington, D.C., Anchorage, and San Francisco, Hopson asserted that the U.S. was not authorized to submit the dietary habits of U.S. citizens to the arbitration of the IWC. Most recently, Hopson's efforts were directed toward the environmental protection of the Arctic in the face of oil and gas development. Marshaling the best talent he could find, he mounted a detailed zoning plan for the Arctic coast and presented to the state and nation a Coastal Management Program which he felt provided for an environmentally safe program for the industrial development of America's Arctic coastline. As the state and federal governments approached the Joint Federal/State Beaufort Sea Oil and Gas Lease Sale in 1979, Eben and his staff scrutinized the Environmental Impact Statement and found it wanting in several important areas. He sued to stop the sale and found a sympathetic ear in U.S. District Court Judge Aubry Robinson in Washington, D.C., who enjoined the sale because of the failure of the government to exercise its Native trust responsibility, and for neglecting protection of the endangered bowhead whale. The bowhead battle put to the test the Native trust responsibility of the U.S. government, an issue not yet fully resolved and embodied in the Hopson vs Kreps suit. Hopson entered Barrow Indian Health Service Hospital on June 16, 1980. After several days in a coma, he expired on June 28, 1980, the opening day of the Second Inuit Circumpolar Conference in Greenland. He was 57 years old.